When we look at Jesus’ life, we see him regularly eating with all types of people. In fact, it was often shocking with whom Jesus ate. He ate with women, crooks, non-Jews, tax collectors and others. Some of Jesus’ most well-known teachings, are taught centered around a table with friends and followers. What can we learn from Jesus about sharing our own tables and lives with people in our com munity? What changes will we need to make, in order to bring others to the table where Jesus makes room for us all? 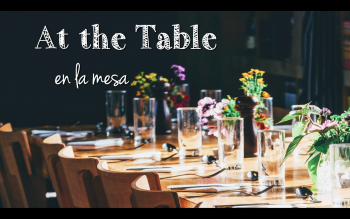 Join us this Sunday at 11 a.m. as we continue our new teaching series, At the Table, and explore the gift and spiritual importance of hospitality, and making spaces of belonging for everyone. Hope to see you there! 4862 Broadway, 1st floor cafeteria.